Ten years after 9/11: What are key Asian states saying? This past weekend, the U.S. commemorated the ten year anniversary of the September 11 attacks. Across the globe, other countries also took a moment to reflect on this day. In this post, we examine views from Russia, India, China and Japan. InRussia, commentators asserted thatU.S.unilateralism in the “war on terror” has interfered in the internal affairs of sovereign countries. At the same time, they concede that the Kremlin also lost an opportunity to deepen U.S.-Russian relations in the 9/11 aftermath. 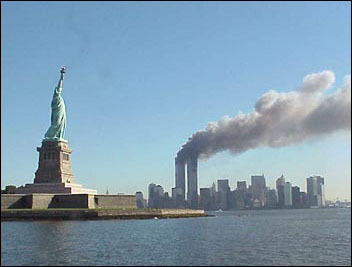 The Russian Foreign Ministry stated that although the 9/11 attacks were “provocative and cruel,” they also led to broad international cooperation that has helped to bring global counter-terrorism cooperation to a higher level. The Foreign Ministry emphasized thatRussia supports an international coalition of nations, as opposed to some form of unilateralism, as the best mechanism for battling against the specter of terrorism. Another editorial in The Moscow Times attributes the dramatic increase in opium production and drug addiction-related deaths in Russia as an offshoot of the decline in U.S.-Russian security cooperation. The author insists that Washington has a “moral responsibility” to help Moscow control the flow of drugs from Afghanistan. RIA Novosti military commentator Konstantin Bogdanov remarked, “If there’s anything that the ten years of the ‘war on terror’ have demonstrated, it’s that the world leader is incredibly isolated. America is stubbornly and methodically trying to impose its own designs on a desperately recalcitrant world.” As the state news agency, RIA Novosti’s views are close to the current government position and reflect what the Rising Powers Initiative has identified as the Great Power Balancers viewpoint—those that seek great power status in relations with U.S. and China. How is the Asian region responding to the death of Osama bin Laden? In this blog post, we examine the domestic viewpoints of India, Iran, Russia, China and Japan, especially their reflections on terrorism, U.S. presence in Afghanistan, and the role of Pakistan. In India, most commentaries focused on India’s relations with Pakistan and Afghanistan, while some reflected on the ongoing democratization processes in the Middle East. The Hindu described the revelation of bin Laden’s presence in Pakistan as a “moment of truth…similar to the discovery that the 2008 Mumbai attacks were launched from its territory,” but it nevertheless urged restraint in Indian diplomacy: “While it may be tempting to see bin Laden’s killing at Abbottabad as confirmation of India’s worst fears, New Delhi must resist the temptation to crow, and must push ahead with the peace process with the civilian government of Pakistan.” The Indian Express had a similar view, saying “India has to continue to be innovative and largehearted in engaging with as large a section of the Pakistani establishment as it can. The Times of India wondered whether the U.S. would accelerate its troop withdrawal from Afghanistan, and expressed deep worry that this could “easily lead to chaos with serious security ramifications for the region, including India.” The Indian Express urged more cooperation with the U.S. on Af-Pak peace: “The death in Abbottabad is a reminder of the realism needed to negotiate the new great game being played for Afghanistan after the drawdown of American troop presence….Given its limited leverage within Pakistan, India must also be engaged with the US and the international community on steps towards Af-Pak peace, to prevent the re-emergence of Afghanistan as a hotbed for extremism and also to enable political stability in Pakistan. Other commentaries in the Hindustan Times, Economic Times, and Indian Express all noted that al-Qaeda had originally sought to overthrow the regimes of Egypt and Saudi Arabia, but now the pro-democracy movements of the “Arab spring” are showing the region’s disenfranchised youth an alternative to religious radicalism in pushing for political change.